4 Inch Promotional Circle Labels - Removable Clear Film Matte Lamination are perfect for the use with spice jars, mint tins and product seals. Matte finish makes these custom stickers look nice while the clear film make it blend with the background easily. Another main highlight of these custom labels is that they can be applied with ease and with great speed. 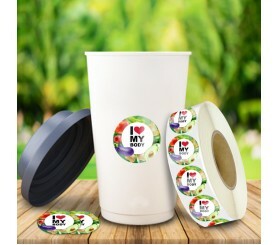 Removable adhesive is another main feature of these highly durable custom circle labels. Order these products today to gain free online proofs, free design and free shipping offers. Request a quote to know what you can save on ordering 4 Inch Promotional Circle Labels - Removable Clear Film Matte Lamination.